Welcome back to another 2015-16 Stampin' Up! Artisan Design Team blog hop. If you are already going through the hop, you should have just arrived here from visiting my very good friend, Cindy Schuster. When you leave here you will travel on to visit Inge Groot. For this particular hop we could use anything we wanted to create our projects, as long as it was part of our quarterly box of supplies from Stampin' Up! I adore this beautiful stamp set called Birthday Blooms, so I decided to focus on it. After all the stamping was complete, I used reinkers and an Aqua Painter filled with 91% Isopropyl Alcohol to color the images. This is how I often color my images, so no big surprise here! (Reinkers: Soft Sky/Marina Mist, So Saffron/Daffodil Delight, & Old Olive.) Here is the thing about this method...the colors sometimes take on a different hue when mixed with alcohol. I guess is it somewhat of a chemical reaction that occurs. The alcohol helps the water in the reinker evaporate and then when you paint with it there is much less deterioration of the cardstock. I only mention it, because the leaves don't really look like I used Old Olive ink, so I wanted to explain why. After everything was dry I used the fine tip of my Stampin' Write markers (Marina Mist, Hello Honey, Old Olive) to hand draw some accents for a more realistic touch. Finally, I added a fun strip of Daffodil Delight polka dot dsp to the edge and some linen thread to finish off this masterpiece. I am not gonna lie, this did take some time to color, but I find it relaxing, so no problem there. 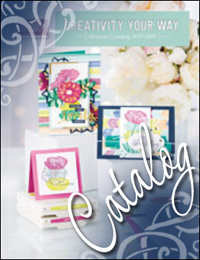 Tags: 2016 Occasions Catalog, Artisan Design Team, Birthday Blooms, faux alcohol, flowers, Stampin' Up!